Enter the unbridled, dispiriting, ravishing, gloomy, atmospheric, bewitching, terrifying, reinvented world of STALKER that will get you hooked for days. Note: we are in the middle of the new 2012 update, the current and the latest available mod version is STALKER Complete 2009 1.4.4 until further notice. If you haven’t played 2007’s most immersive and atmospheric shooter, or you’re back for replay, this mod is for you. This is the world of S.T.A.L.K.E.R. like you’ve never seen before, with updated graphics and added functionality that don’t change the original story or gameplay. The game hasn’t been changed beyond recognition, but rather enhanced while preserving the core elements that made it the unique experience is it. 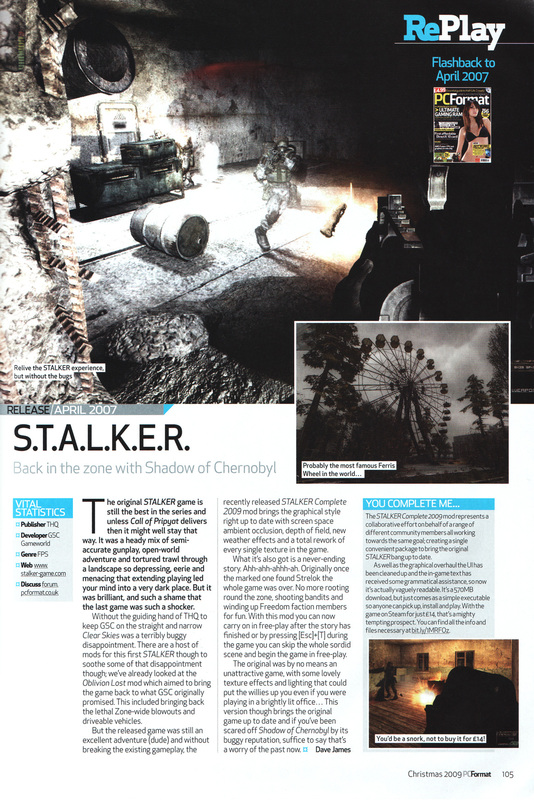 STALKER Complete 2009 defined the standards for making S.T.A.L.K.E.R. mods, and its successful formula has inspired many similar projects. Natural multi-phase day and night transitions, based on daily observations, photographs, and studies by artists from Dolgov Studio. New multi-phase moon design authored by Dolgov Studio. Different types of storms, fast and slow. Screen Space Ambient Occlusion - A shading method that approximates the way light radiates in real life, creating soft shadows in corner-type places with a difficult lighting sample. Depth of Field - An effect that creates a gradual decrease in sharpness determined by the subject distance. For example, a distant landscape will appear blurry when compared to closer objects. Locations - all textures replaced with higher quality photographs with partial use of original files, creating highly detailed outdoor and indoor environments. Stealth - Knife and other critical sounds such as falling dead bodies, grass, and footsteps have been properly commented to reduce their sound radius, making the gameplay much more realistic. A visual overhaul mod isn’t complete without a new, custom user interface. This is why we are proud to present our very own Main Menu, Loading Screen, and redesigned HUD. Created by our graphic design firm, the interface incorporates existing in-game art and photographs of actual Chernobyl disaster zone artifacts, adding a unique art style and authentic feel. Certain buttons have been conveniently reorganized for more intuitive access and new shortcuts added, such as ESC+S which works like a “smart quick-save”, creating a separate save file with the level name, in-game date, and timestamp each time it’s used. ZRP Teleport - The ESC+J shortcut lets you jump between the points in the environment. Third-Person View - Press F1, F2 and F3 to cycle through camera views and + or - to zoom in & out. (by default this feature enables camera toggle only, add -psp switch to a shortcut to activate a third-person gameplay, please refer to Technical FAQ page 15 for assistance). After your journey ends with the “good” ending, you’ll get the dialogue that will let you continue the game in freeplay mode, allowing creatures and NPCs to migrate freely about in the environment. It will be a living and breathing zone with self sustained A-Life and unscripted events. This feature doesn’t remove the ending scene, so players will still have the enjoyment of viewing the cinematic completion of the game. You can skip the entire story line from the start by pressing ESC+T while in-game and teleporting to the last map or by clicking Freeplay and “Equip for Level” to start from the first map. This mod will run smooth as long as you have a video card with Shader Model 3.0/4.0 and large amount of memory to accommodate the high quality textures. It performs better than S.T.A.L.K.E.R. Clear Sky and S.T.A.L.K.E.R. Call of Pripyat, while providing similar and often better visuals. It’s DirectX9 and the X-Ray engine at their full potential and the best looking mod for this game. Someone wrote: Lighting – the new day-night cycle’s particularly spectacular – and textures are what’s most lovingly touched by the hand of mod, but on the non-graphical front much of the in-game text gets a more grammar-friendly rewrite and the HUD receives a much-needed overhaul. Someone wrote: [...] the graphical changes are immediately smack-you-in-the-face obvious. It's stunning. Whereas looking at old STALKER made me think of, well, a 2007 eastern European PC title, the texture and shader upgrades in STALKER Complete 2009 made the place instantly come alive. 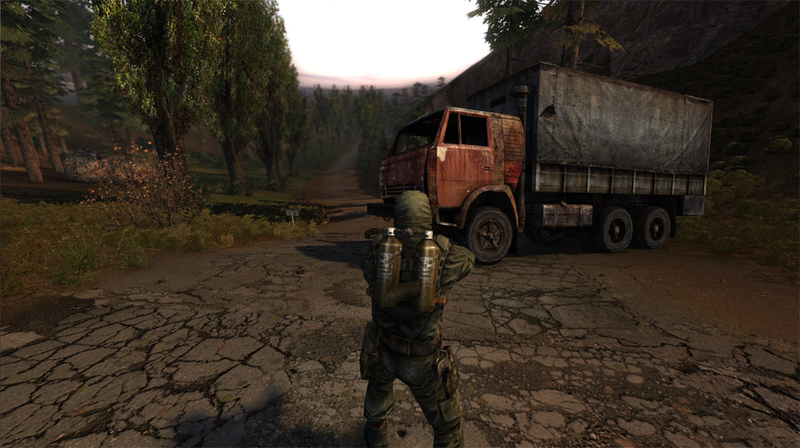 Someone wrote: Stalker Complete 2009 combines several modifications that improve Stalker: Shadow of Chernobyl in matters of graphics, gameplay and atmosphere. Someone wrote: As mods go this is one of the most subtle imaginable. It does not attempt to change the atmosphere or effect of the game world, but simple to enhance it. 900 new textures, an improved sky and weather system, and the introduction of expanded graphics options make this one of the most exquisitely beautiful experiences ever to grace a gaming system. [...] this is, finally, the finished and complete version of Stalker - as good as it could possibly have been on release. Cool! Are there any of the community made weapons included? That would be kind a nice, even though I'll only play this mod from now on! New weapons will be added with next updates, thanks! I guess you'll also add new armors? i hope you will add the arsenal mod to this mod :D then i would defently download it! Will the weapons be region accurate? There are a great many eastern bloc weapons that can be used. The Fort-500 shotgun, Bekas-M, Saiga 12, and those are just shotguns. Would it be possible for you to save the custom weapons for a different mod or something? The reason I love this mod is because it doesn't force me to have custom weapons in it. Is there any way to uninstall the mod? Great job on the mod! Stalker is an underrated game. This mod overhauls the graphics to degree that is better than a lot of game currently on the market. The amount of time, effort, and dedication put into this project is absolutely incredible. Fantastic job! holy crap! this looks to be quite an amazing upgrade to an already amazing game! i'm going to try this out right away! i feel so ashamed saying this, but i never did play all the way through stalker. maybe this will give me the incentive to go back and finally do it. ". You can also dress NPCs by selling or dropping outfits near them and giving them privacy to change." what the ****? was this place in here to see if people are reading? No, it means, you have to be at least 15 meters far from them and look away, the game can't swap outfits while you look at it. Do you have any women NPCs I wouldn't have a problem in dressing them? Be a little odd to well... dress a hmm male npc... yea... is there a point in dressing a npc? Ok, dress is the wrong word, you just give your friendly stalkers better armor. where is the 1.4 changelog? omg where i put mah stalker dvd ?!?!?!?! Looks very impressive...I wish I had my stalker dvd here. Does the Trader at the Cordon offer Weapons Repair services? Bleh, the 5 min edit limit. I've encountered some rather big bugs, one being that whenever it rains, there's polygon shards everywhere. Is this a common occurrence? Anyhow, very nice work and I'm highly appreciative that you guys took your free time to make this. Regarding polygons, it has something to do with drivers or video card shader model, I've seen fixes for that before. as far as anomaly evasion, apparently I forgot to turn it on, thanks for catching that, to fix it you would have to go to gamedata\scripts\_z.script (with notepad), find the 5th line that says 'sanb_enabled = false' and change it to 'true'. Only Screw and Bar Trader can repair, because you can loot a repair kit from NPCs. I loved STALKER, however the bad optimization and the numerous bugs had me quit the game. Now that I have a better PC and this Huge pack is out I am going to start it over. Is this mode gonna migrate to STALKER:Clear Sky anytime soon? Looks really promising. Didn't enjoy stalker that much before gotta try this. Good job. Version 1.0 had similar weapon settings to what you are looking for, you can copy gamedata\config\weapons folder from v1.0 to v1.4 and see if it works out. if i wanted to play stalker should i get this or clear sky? You should play Shadow of Chernobyl first (with this mod recommended), and Clear Sky second for proper story progression. Is it compatible with any realism mods regarding damage? My favorite mod to play this game with (can't play without it) is one where bullet damage is pretty devastating, meaning you could shoot a guy once or twice and he would be incapacitated or killed. Have you started a new game? I can´t even start the game, I get this Stalker picture at the beginning and then my screen turns black and then I´m back at my desktop with the message I postet before. I have all the latest drivers and I patched stalker to 1.0006. Complete 2009 retains more of original game with focus on visuals and bug elimination, suits first time players, L.U.R.K. adds extras for people who are familiar with game and want more. Now let me tell you guys congratulations for making this awesome mod.Yeah its true that the enhanced graphics are pure awesomeness and the differences between the original and the modded Stalker smack you right in the face but theres so much more that this mode offers us.STALKER looks now amazing, i never finished it the first time cause of the infinite bugs that ruined the gameplay, but now im playing it and god this game looks and plays like heaven,thank you for reinventing this marvellous shooter and for sure this is the mod of the year, try it guys and vote for it cause the developers of the mod deserve it.Its nice to see developers doing such an amazing mod for us to enjoy for free so here it is a BIG THANK YOU!!! Hello! Thanx a lot for your efforts all of you modmakers!!! It looks absolutely groovy what I can see from the screenshots!!! Played Stalker for my third time about four months ago. Had the original game in box since 2007 and become very exited when I got eye for your work. Also played Clear Sky a couple of times and thanx to gifted mods creators the game turned out beeing all that it was meant to be..SUPER - fantastic! Now here comes my question..I´tried to install "Stalker Complete 2009" to my original box "Stalker of Chernobyl" game but couldn´t make it work. 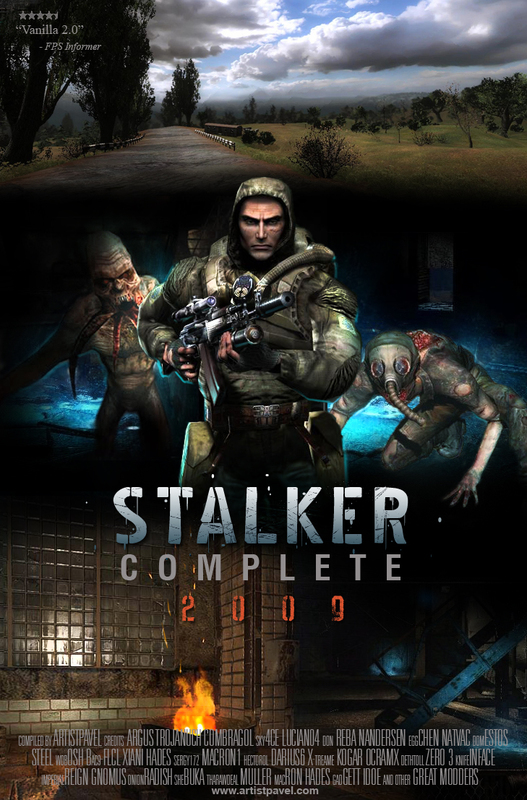 SO MY QUESTION IS: DOES THE "STALKER COMPLETE 2009" ONLY WORK FOR THE DOWNLOAD VERSION FROM STEAM AND NOT FOR THE ORIGINAL BOX GAME? It works with any version of Stalker: Shadow of Chernobyl, what kind of difficulties you had? Sometimes the installer can't find the game, in that case, the manual installation should work. Great mod! Is there any way to let the cordon trader repair your stuff? I love it to roleplay in freeplay and it is strange that you always have to run to the bar for repairing the weapon. This is a great mod, great graphics without a serious fps hit. I have a problem, I can't get into room 26 to get the door decoder. I click on the door, it makes an opening sound, but the door itself stay shut. Anybody have an idea how to fix this?